Already have a Username/Password for Jurnal Pendidikan Fisika dan Keilmuan (JPFK)? Template in this author guidelines actually uses start at volume 3 issue1 in march 2017. The manuscript that has been written under the guidelines of JPFK (in MS Word format, use this article template) must be submitted through Online Submission System using Open Journal System (OJS) on the JPFK E-journal portal (http://e-journal.unipma.ac.id/JPFK) choose only one procedure. Then, register as one of the author or reviewer in the “Register” bottom. The manuscript article writing guidelines and template can be downloaded. The template and the guidelines of the article writing are avaliable in Ms Word (.doc) format. The manuscript whisch is inappropriate with the JPFK writing guidelines will be returned to the author before the reviewing process. The manuscript should contain several aspects of a scientific article as follows: (subtitles as the order), which are: (a) the title of the article, (b) the author’s name (no accademic title), (c) the afiliated author’s address, (d) the author’s email (e) the abstract and the keywords, (f) the introduction, (g) the research method (h), the research findings and disscussion (i), the conclusion (j), the references. The manuscript can be written both in Bahasa Indonesia or English with the standard language. The manuscript shuould consist of 8-15 pages including pictures and tables. The manuscript text ought to be written as this article template in the camera ready mode. The article is written on A4-sized papers (210x297 mm), with custom margins as follows: left 25 mm, right 25 mm, bottom 25 mm and top 30 mm. The text of the articles must be in Time New Roman, 12pt font size, 1.5 line-spacing, separated into two columns (except for the main title, the author’s name, and the abstract) with the space between columns 10 mm. The words from uncommon or foreign languages are stated in Italic format. For the article in Bahasa Indonesia, foreign terms or words should be avoided. Each paragraph started 10mm from the left side border while there is no spaces among paragraphs. All numbers are written in Arabic numbering format, except for the new sentence. The document should submitted by Online Submission System in the JPFK(Journal of Public Policy and Administration) E-journal portal here. Firstly, the author should register as either an author or reviewer (checking role as author or reviewer) in the “register”. 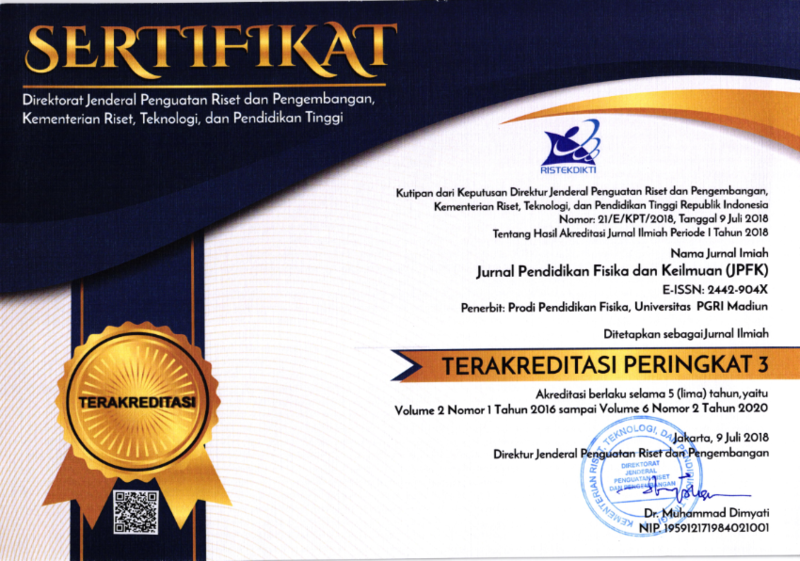 Jurnal Pendidikan Fisika dan Keilmuan (JPFK) by http://e-journal.unipma.ac.id/index.php/JPFK/index is licensed under a Creative Commons Attribution-ShareAlike 4.0 International License. JURNAL PENDIDIKAN FISIKA DAN KEILMUAN by http://e-journal.unipma.ac.id/index.php/JPFK/index is licensed under a Creative Commons Attribution-ShareAlike 4.0 International License.